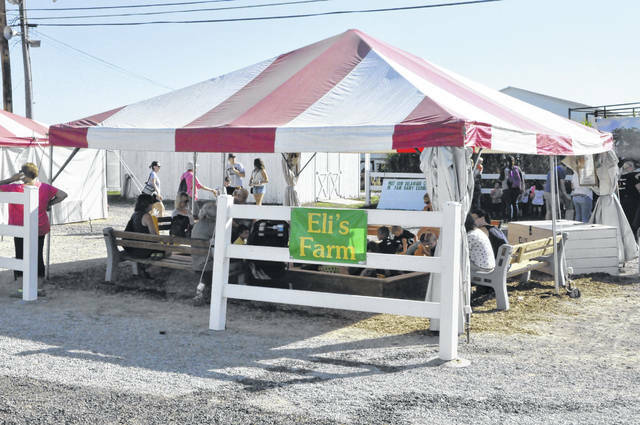 Pictured is Eli’s Farm, which the Lehner family sets up every year at the Delaware County Fair in honor of Eli Lehner, who passed away in 1997. The tent is located just outside the Dairy Barn at the Delaware County Fairgrounds. 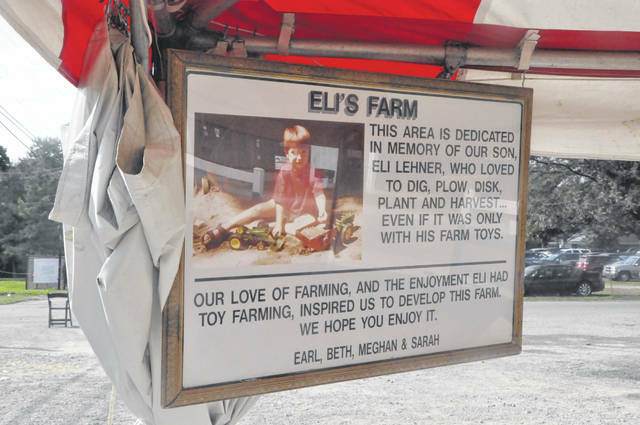 In one corner of the tent that houses Eli’s Farm every year at the Delaware County Fair hangs a memorial to Eli Lehner. The 3-year-old lost his life in a car accident back in 1997. For the past 20 years at the Delaware County Fair, Eli’s Farm has provided children with a place to let their imagination run wild, while giving parents and grandparents a spot to relax or escape the weather. Pictured inside the Eli’s Farm tent are several benches along with a large sandbox, complete with farm and construction toys. The 2018 Delaware County Fair is in the books, but rest assured, when the 2019 version kicks off next September, a fair favorite will once again provide the youngest fairgoers a place to explore their imagination while visiting the fairgrounds, just as Eli Lehner did two decades ago. As owners and operators of DEE Lehner Farms in Troy Township, the Lehner family and the Delaware County Fair have gone hand-in-hand over the decades. During this time, the family has enjoyed a longstanding tradition of showing dairy cattle during the fair, so it was only a matter of time before Eli was introduced to the sights and sounds of the annual gathering at the Delaware County Fairgrounds. Months before the tragic accident, Eli spent the 1997 Delaware County Fair doing what most 3-year-old boys do to pass the time — play with toys, especially those with wheels. In Eli’s case, he found the dirt aisles of the dairy barn to be the perfect location to stage his own little farm, complete with all his favorite farm toys. “Children would stop and want to play with Eli and his farm toys,” Lehner said. With this image of her son forever etched in her memory, Lehner said the family decided to give other families who visit the fair the chance to create lasting memories of their own by giving children a place to imagine they are operating their own little farm, just as Eli once did in the dirt of the dairy barn. 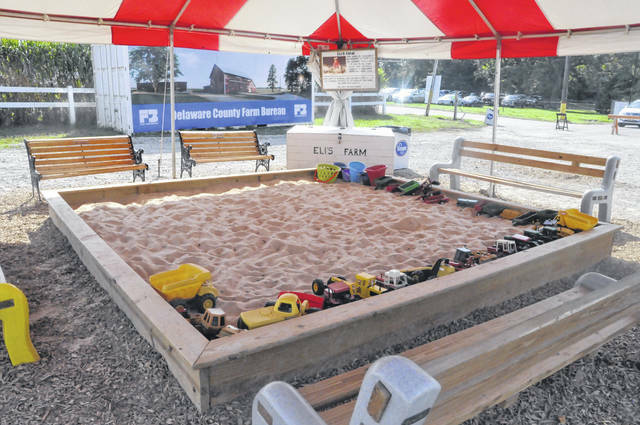 With approval from the Delaware County Fair Board, Eli’s Farm, which features a large sandbox complete with various farm toys as well as several benches for parents to rest on and watch their child’s imagination at work, was established 20 years ago. Flash-forward two decades and the yearly attraction, which is set up just outside the Dairy Barn, continues to be a favorite among families who attend the Delaware County Fair. Knowing Eli’s Farm has become a staple for families attending the fair has helped the family cope with its loss, while also keeping Eli’s memory alive. A photograph of him playing with his farm toys hangs from one of the corners of the tent that helps keep the rain and sun away from the sandbox and benches. Lehner said while Eli’s Farm hasn’t changed much over the years, there’s always a chance the family could tinker with it in the coming years. Whether there are any changes made or not to Eli’s Farm when it opens next September for its 21st year, one thing is for sure — the Lehners have no intention to stop putting out the sandbox, farm toys and benches for fairgoers, especially now that another generation is ready to make memories in Eli’s Farm. Contact Joshua Keeran at 740-413-0900. Follow The Delaware Gazette on Twitter @delgazette. Like The Gazette on Facebook.